[SatNews] The gods have been good to space entrepreneurs lately, showering them with unprecedented amount of venture capital funds on business plans revolving around nano- and microsatellite based operations. The hype and expectations surrounding these space startups has set the industry abuzz with mixed opinions on their success and business model sustainability. A platform primarily used for technology demonstration and university missions, small satellites have found favor with the business and financial community for implementing business models that disrupt the traditional space business and open up a plethora of new markets based on downstream applications like image analytics, asset tracking, and high-speed data connectivity. Among the many potential applications of these small satellites, NSR’s Nano and Microsatellite Markets, 2nd Edition found that Earth observation (EO) has emerged as key driver for this industry’s growth, with large constellations being planned and deployed by startups such as Planet Labs, Spire, Satellogic, PlanetiQ, and Black Sky Global, to name a few. Earth Observation, a market dominated by defense & intelligence needs, scores above other small satellite applications due to a situation of ‘data poverty’ in industry verticals such as agriculture, disaster management, forestry and wildlife, and financial services. 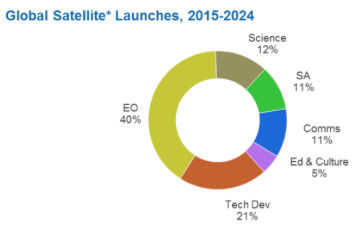 In its research, NSR found that 40 percent of the nano and microsatellites planned to be launched by the end of year 2024 will be for EO applications, which will contribute a staggering 58 percent of the total manufacturing market (~ $400 million). The demand for EO services using nano/microsatellites is primarily being driven by consumer-oriented and data-driven applications that operators are hoping will unlock previously untapped markets. But the key question here is which of these new markets are ready to adopt and pay for such innovative services that they do not completely understand, and above that, what will be the differentiating factors for source agnostic EO product users in the upcoming scenario of oversupply? Most of these small satellite operators are currently organized in a vertically integrated manner. Though such an approach provides greater control over the product, the operating costs far outweigh the operating revenues for Silicon Valley based firms until their systems and target markets are fully established. So it comes as no surprise that established firms are being targeted by cash-rich EO start-ups for getting access to stable revenue streams and rich image archives. NSR considers the nano/microsatellite market to be still in its early stage of development, with best practices and operational strategy still evolving. The trade-offs between asset performance, accessibility to launch services, and business profitability will drive small satellite operators to find that ‘sweet spot’ in sizing the satellite. Hence, the iterations of constellation and satellite size is expected to continue while more consolidation happens in this industry to keep a check on the holy grail of ‘costs vs revenues’ debate. The fortunate companies which survive this phase will surely set new standards in the satellite industry in terms of innovation in manufacturing, operations, and sales strategy. It is therefore no surprise that established firms like SSL, Thales Alenia Space and Airbus D&S have made a move into small satellite either directly or through subsidiaries. Nano/microsatellites have definitely arrived as a reliable and low-barrier means of entry to satellite markets, and offer more synergies than threats to established large satellite manufacturers and operators. Though buzz words like ‘Big Data Analytics’ and ‘low-cost access to space’ are helping small satellites to increase the dynamism in satellite industry, the key issue of striking the right balance between investor expectations and business model execution capability still remains unanswered. NSR expects current small satellite business models to evolve in the near-future towards adoption of slightly larger form factors for nanosatellites, giving operators the necessary breathing space to actually focus on harvesting the data and employing it in unique end-user applications.